Abe Purungganan, in his Facebook post, he listed 230 names of Philippine Maritime Academy (PMA) alumni and cadets that condemning Senator Antonio Trillanes IV for his behaviour towards Senator Allan Cayetano during the Senate hearing. Purungganan criticized Sen. Trillanes described him as a bully and his character nor a gentleman. 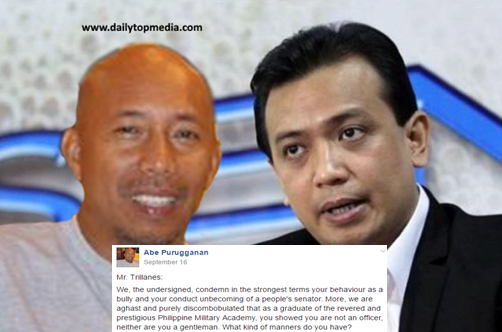 He also said that Trillanes was an embarrassment to PMA and to his family. He also said that Trillanes must show some politeness and humility and should apologize to Sen. Cayetano for his misbehaviour.
" For what shall it profit a man, if he shall gain the whole world, and lose his own soul? James Andres B. Melad PMA '82. Francis Yuseco - Muntinlupa City. RAIZEL GALICIA, CIASI NATL. CHAIRMAN - U.A.E. LIZA DUPAYA EVANGELISTA, CIASI SORORITY INTL.SEC.GEN. Roberto T. Capco, Mandaluyong City. (Note: If you desire to affix your name please advise me and then share. Thank you.